[2011 was the last run] Yes, I've done it again! I've managed to forget about a container in the deep freezer. The good news is that I just checked and this flavor is still lingering, so if it sound good, you might still be able to find it. 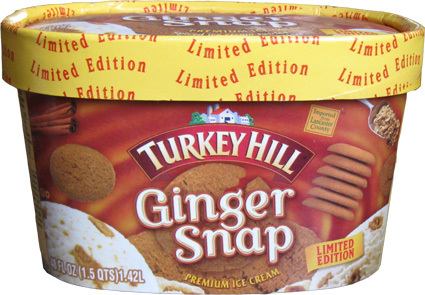 Our unlucky lost specimen today is limited edition Turkey Hill Ginger Snap Ice Cream. It's spiced ice cream swirled with ginger snap cookies and is basically aimed at the holiday crowd that isn't in the mood for peppermint or pumpkin flavors. Oh I like this close up. Check out all the cookie pieces, they're everywhere! Time to bring back the penny test! When Turkey Hill says ginger snap cookies, they literally mean there cute mini cookies. They're not too hard and not too soft and they taste pretty good (that white stuff isn't filling, it's just ice cream that wouldn't wash off without wrecking the cookie). My worry with this "spiced' ice cream is that it would be just that, too spicy. Now that I've tried it, I realize that I shouldn't have been worried. It's a nice mild flavor with a good texture and we all enjoyed it. We all got plenty of cookies in our bowls so that was another positive. I only had a small serving so I had all the more reason to be craving a second bowl on this one. Ginger snap just isn't one of those flavors I could dive into at any time, but it's well done and I just don't really have any complaints today (well, unless I want to be picky about partially hydrogenated oils in the little cookies, but other than that). If you see this flavor still hiding in your freezer aisle, go ahead and feel free to try it. On Second Scoop: You know what? This is a great morning flavor! In general (more or less), I think of chocolate as an afternoon snack, but I'm all for grabbing a couple of cookies in the morning. 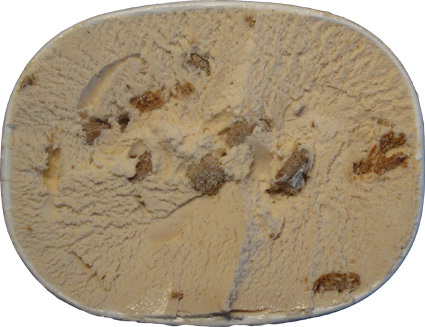 You know oatmeal, oatmeal raisin, even whole grain fig newtons (the only kind I eat really), they all have a morning vibe to them, and so does this ice cream. Man did that bowl hit the spot! Whoa. That looks wicked good. I'm going to try to hunt down a container (or two). I have gotten lucky in the past and found a single, leftover special/seasonal flavour at the market. Fingers crossed for this one! Turkey Hill needs to bring this flavor back so I can taste it! Do you know of any good Ginger ice creams on the market?